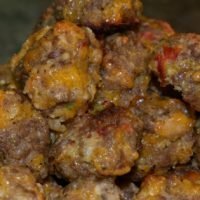 This recipe for Low-Carb Keto Sausage Balls is so simple that you can make them on a weeknight. They are the perfect indulgence for keto dieters. These crispy Low-Carb Keto Sausage Balls made with cheddar and almond flour are a great salty and sweet treat. Pair it with the tangy dill dip for a perfect blend of spicy and tangy. I use the frozen pepper and onion blend for this recipe. While it’s not at all spicy, sometimes the kids can get a little squeamish when they see the vegetables. I just pop them in the food processor for a few seconds until they are super tiny. The kids never even notice. Of course, you could skip that step and dice them if you prefer. I mix all the ingredients together all at one time using my KitchenAid Mixer This way is super quick and easy. However, it’s not too difficult to mix the ingredients by hand. My biggest complaint is that it’s cold. My trick is to use rubber gloves to keep my hands warmer. Whichever mixing method you use it’s important to make sure to get all of the cheese and almond flour off of the bottom of the bowl. Make the sausage into 1.5-2 inch diameter balls with your hands and place them on a baking sheet or large glass pan. It’s important to try to make the balls as close to the same size as possible. This way, they’ll all finish baking at the same time. Bake about 15 minutes at 350 or until crispy on the outside. 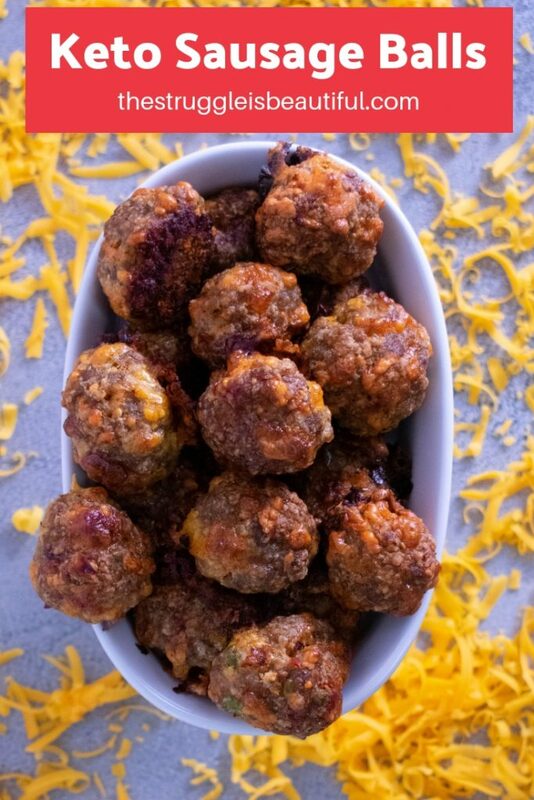 These delicious keto sausage balls made with cheddar are the perfect combination of sweet and spicy, the perfect indulgence while not cheating on your diet. Stir all ingredients together until well combined. There should be no flour or cheese in the bottom of the bowl. Roll Sausage into small balls and place on baking sheet. *As always calculate your own macros as they vary using different brands and different apps. This recipe is low-carb, but still high in calorie. So be careful with this one, especially since their bite-sized form makes them perfect for over-eating. However, this is the perfect recipe to bring to a party where there will be unhealthy options. It will give you something low-carb to have while not feeling like you are being totally restricted. 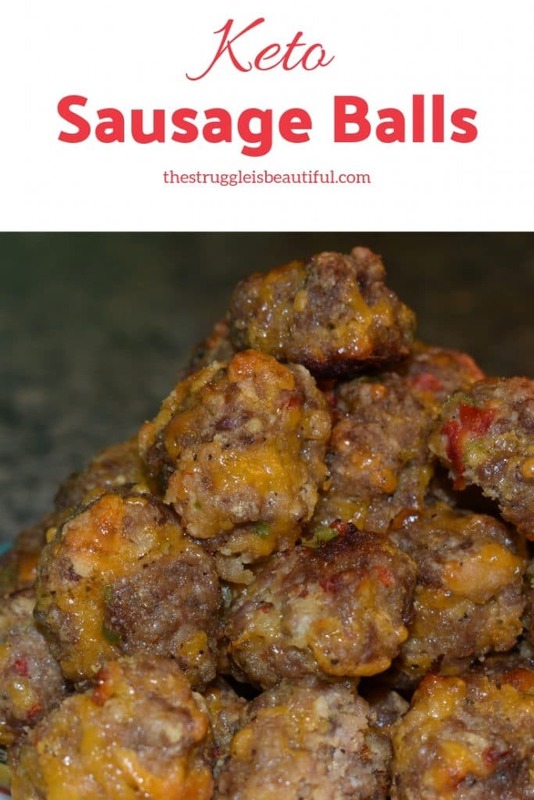 As long as you are disciplined and save room in your macros for them, these sausage balls are perfect! I love them when I’m craving something “bad” or feeling super snacky. Sometimes a girl just wants something sweet salty and crispy. What are your go-to low-carb appetizers? Share them in the comments below! Be sure to check out some of our other Keto Recipes before you go and sign up for our email list below for even more awesome recipes sent straight to your inbox.